As I walked out in Verona one day . . . Entering the beautiful and rustic Adobe State Historic Park in Petaluma, audience members for We, Players’ “Romeo and Juliet” are offered scarves, red or purple, representing the Montagues and the Capulets. A household servant, Peter, encourages them to wear their colors and cheer their side of any disputes. Just before the audience begins their walk on a winding path through the brush and cactus, Peter (an excellent Amy Nowak) slides seamlessly into the play’s opening monologue: Two households, both alike in dignity. . . Urged to walk quietly, the audience moves in measured steps towards the park’s famous adobe structure. There is birdsong and wind, long shadows in the late afternoon light, before rounding a corner where we spot Antony, a servant to the Capulets, seated on a rail. The illusion of having stepped into a strange town is nearly perfect. It is a magical moment, interrupted by the arrival of a Montague who begins to pick a fight and then the game is on. We quickly accept the assumption that this “Verona” is not renaissance Italy but frontier California, and the characters are dressed not in silk and velvet, but leather chaps and cowboy hats, although carrying swords. The anachronisms are not in the least disturbing, largely thanks to the excellent costumes by Brooke Jennings, and the expert handling of the language by the ensemble. Mohammad Shehata’s Romeo is distinguished by a ready laugh and mercurial emotions, refreshingly less emo than most. Juliet (Maria Leigh) is unabashed in her sexual infatuation. As Mercutio, Courtney Walsh beautifully delivers the famous Queen Mab speech, and John Steele, Jr., is a delight as the peace making party boy, Benvolio, whose efforts to stop a fight end in disaster. All of the other cast members deliver straightforward performances, emphasizing clarity of language and excellent story telling. The performance works best during these wonderful moments of audience participation: the walk to the Adobe, the cheers for Capulet or Montague during the fight, the Capulet’s ball where we all donned masks and danced with the actors. Love struck Romeo (Mohammad Shehata) and the easy-going Benvolio (John Steele, Jr.) share a happy moment. Photo Credit: Lauren Matley. As far as the story is concerned, however, things do not go as well. Although the language is handled beautifully, the tragic details of the story do not sit well with the party atmosphere and audience participation elements of the presentation. Since the story is so well known, many scenes seem like necessary medicine we are forced to consume before moving on to another beautiful image or moment of participation. Things would be much improved with a great deal of merciless cutting, allowing the images and the visceral experiences to take precedence over the language. Of course, this is Shakespeare, and the language is supremely beautiful, but, after all, once you have set this poetry in the old west and dressed it up in chaps, it seems okay to let go some of the niceties. The final moments are suitably moving, and there is a true sense of catharsis and grief as we walked way from Verona in the dark along the path we had come. ‘Romeo and Juliet’ plays at Petaluma Adobe State Historic Park in Petaluma through September 25th, 2016. For further information click here. “Romeo and Juliet” by William Shakespeare. 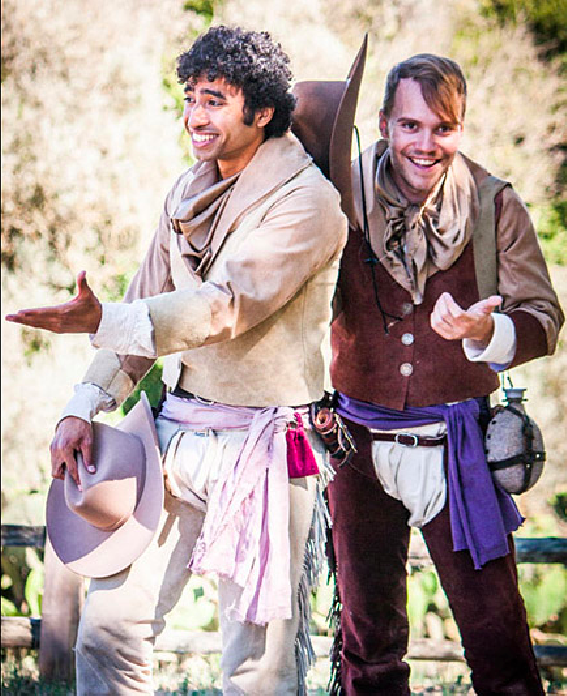 Produced by We, Players in collaboration with California State Parks at Petaluma Adobe State Historic Park. Director: Ava Roy. Original score by: Charlie Gurke. Fight Captain: Britt Lauer. Costumes: Brooke Jennings. Mask Artisan: Monica Lundy. Choreographer: Becky Robinson-Leviton. Fight Choreography: Benjamin Stowe. The Nurse: Jennie Brick. Juliet: Maria Leigh. Antony/The Apothecary: Claire Raider. Abraham/Potpan/Friar John: Rick Love. Peter: Amy Nowak. Capulet: Libby Oberlin. Benvolio: John Steele, Jr. Friar Laurence: Rush Rehm. Romeo: Mohammad Shehata. Tybalt//the County Paris: Steve Thomas; Mercutio//Prince Escalus: Courtney Walsh. Musicians: Nick Carico, Ian Cochran, Brent Elberg, Patrick Malabyo, Aaron Priskorn & Greg Stephens. Posted in Reviews.Tagged Amy Nowak, Ava Roy, Charles Kruger, Courtney Walsh, John Steele, Jr., Maria Leigh, Mohammad Shehata, Petaluma Adobe, Romeo and Juliet, San Francisco Theatre Reviews, theatrestorm, We Players.